Have the kids make their very own Baby Pet Turtles! 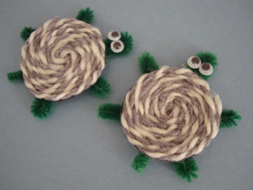 This is a fun and creative turtle craft for school-aged children! Make a whole family in different sizes and colors! 1. Cut a circle from construction paper - choose a color of paper that is similar to your yarn. Our circle was about 2" in diameter, you can make yours as big or as small as you'd like. 2. Spread glue around your circle. 3. Starting in the center of your circle start winding the yarn in a flat spiral. Try to make your spiral as tight as you can. 4. Continue the spiral all the way to the edge of the paper circle, adding more glue as you go if necessary. Cut the yarn and glue the end in place. 5. Cut some green pipe cleaner and make some small "U" shaped legs for your pet Turtle, as well as a head and a tail. Turn your "shell" over and glue the turtle's parts onto the back. Glue on your google eyes and you're done!